The NBA and adidas Originals have always been two closely linked entities, so it’s not shocking that the three stripes commonly push out releases honoring the good old game of basketball. 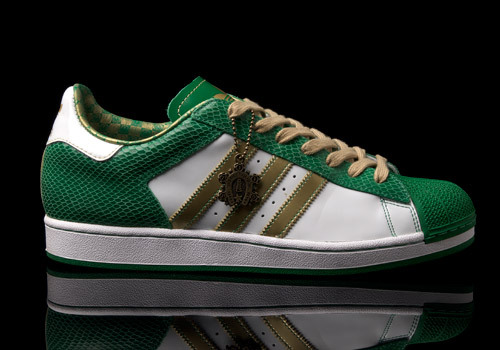 In 2006 adidas put out a special NBA Vegas pack including five different high quality (“lux”) kicks to celebrate the 2007 NBA Allstar game which took place in Las Vegas. 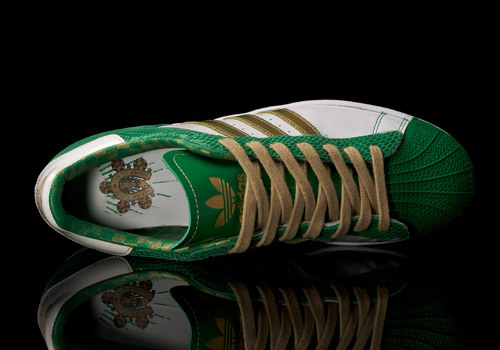 Each of the shoes was meant to represent a different player, and only 1000 pairs were released of each design. 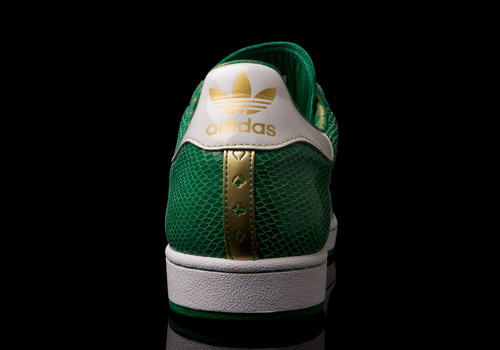 Gil Arena was represented by these white leather and green snakeskin Superstar 1′s. 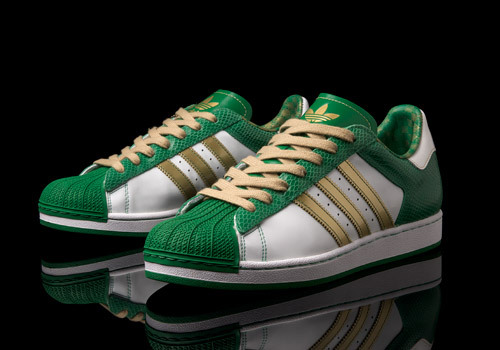 Featuring a green shell toe to match the heel and upper, the kicks sport gold highlights on the side stripes, tongue, heel, sockliner, and insole. 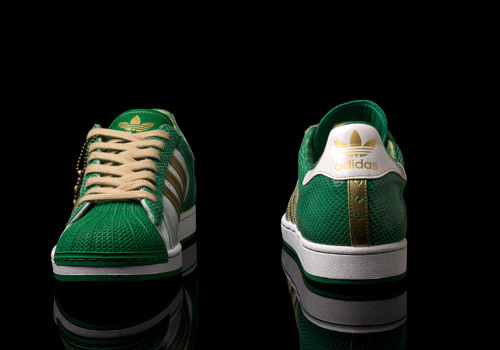 The midsoles are white, the outsole is green, and the laces are a golden tan to match the good luck horseshoe charm that hangs from a small beaded bracelet. 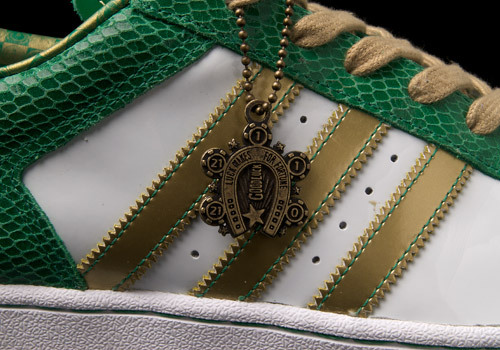 The lucky Las Vegas theme is continued in the details: the four playing card suits running down the golden heel strip, a horseshoe icon appearing in gold and green print on the insole, and the words “luck makes for fortune” written around the metallic charm that comes with these kicks. Thanks for the information. I have you a plug on my listing. 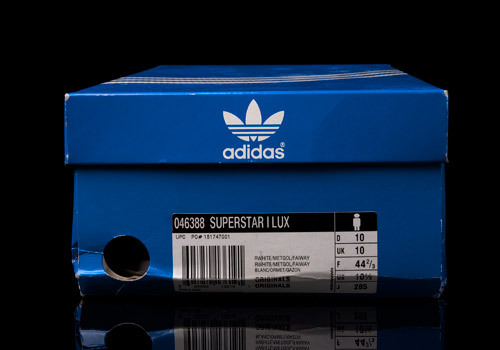 Just listed a pair of these, thanks.